Award-winning, bestselling author Neil Gaiman demonstrates why hes one of the hottest stars in literature today with The Thing About Cassandra, a subtle but chilling story of a man who meets an old girlfriend he had never expected to see. International blockbuster bestselling author Diana Gabaldon sends a World War II RAF pilot through a stone circle to the time of her Outlander series in A Leaf… on the Winds of All Hallows. Torn from all he knows, Jerry MacKenzie determinedly survives hardship and danger, intent on his goal of returning home to his wife and baby no matter the cost. 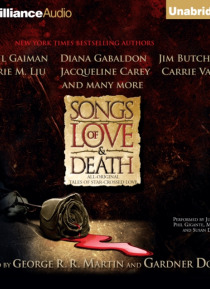 New York Times bestselling author Jim Butcher presents Love Hurts, in which Harry Dresden takes on one of his deadliest adversaries and in the process is forced to confront the secret desires of his own heart. Just the smallest sampling promises unearthly delights, but look also for stories by New York Times bestselling romance authors Jo Beverley and Mary Jo Putney, and by such legends of the fantasy genre as Peter S. Beagle and Tanith Lee, as well as many other popular and beloved writers, including Marjorie M. Liu, Jacqueline Carey, Carrie Vaughn, and Robin Hobb. This exquisite anthology, crafted by the peerless editing team of George R. R. Martin and Gardner Dozois, is sure to leave you under its spell.